How many times have you misunderstood a letter, an email or a text because you misread the intended tone? Whether it was haste perceived as anger, friendship perceived as romance, or sarcasm perceived as sincerity, anyone living in the digital age is sure to have stories of mixed signals. It all just goes to show the significance of tone in all communication, even communication that comes without facial expressions or vocal inflection. That principle even includes the Bible. To better understand God’s Word, we must not only understand the content on the page but also the emotional context in which it takes place. For studying a particular passage of Scripture, I came up with a basic framework that helps me identify the emotional tone, which in turn helps me understand the overall message God is communicating through those specific words. This approach also helps set up the service order and music for corporate singing. Too often a church service is themed theologically, without consideration for the mood emotionally. But getting the mood right is very important. If you don’t, the sermon and the rest of the service won’t align for a journey but collide like a car wreck. Imagine a funeral dirge being played at a wedding or cheerleaders showing up for a funeral. Some church services are like that: emotionally conflicted, confusing and chaotic. 1. Wedding. A wedding is a celebration. Easter Sunday, Christmas Eve, and –14 are sermons that should feel like a wedding. Many passages in Scripture are cause for a big party. The message is exciting, we’re all celebrating, Jesus is alive, sin is forgiven, and we get to live forever in heaven. The tone is energetic and upbeat. 2. Funeral. Other sections of the Bible are like a funeral. A death takes place. Sodom and Gomorrah are destroyed. God floods the earth. Jesus dies on the cross, and the sky goes black. The tone of a funeral is somber and tearful. 3. Classroom. Sometimes the emotional tone of a passage is neither high nor low, but rather even-keeled. Like a professor addressing the classroom, God provides us with certain information that’s communicated on a practical level and tells us what we need to know, think about or work on when it comes to topics like relationships, money, marriage, parenting, work, etc. The book of Proverbs is very much like this. 4. Halftime. I can still remember my first football game in high school. At halftime, we were down. We went to the locker room, and our coach—a big guy with a walrus mustache—got up and just started losing his mind. He gave the guts-and-glory speech, and we all headed back onto the field fired up and ready to go. Like a halftime speech, some parts of the Bible are incredibly inspiring, and the tone is meant to move people into action. 5. Boot camp. A drill sergeant doesn’t waste a lot of time before making a point. A drill sergeant doesn’t say to recruits, “Let’s build a relationship of trust, and I will then offer you some advice.” No. A drill sergeant issues orders that the listeners are simply meant to obey. God is our Lord, and He has the authority and the position to tell us what to do. He speaks with clarity for our benefit, to guard us from folly and damnation, and we disobey to our own detriment. God uses his drill sergeant tone when speaking through many of the prophets with a sense of high authority and urgency. 6. Family. More than a teacher, a coach or a soldier, God is a good dad who loves His kids. For those who have been reconciled and adopted into the family through Jesus, all of God’s words can be read with the tone of a loving father. He encourages, instructs, corrects, disciplines, warns and leads because He loves us. 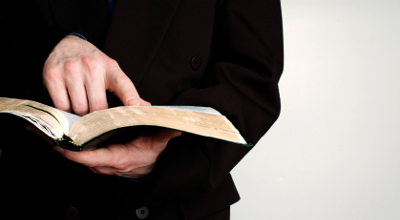 Pastors who prefer a particular tone will gravitate toward the parts of the Bible that match their taste. But read through the entire Bible and you’ll hear a variety of tones, including everything on this list and probably more. For church leaders, the key is to work with your team to have the theological and emotional trajectory of your Sunday service match up with the text you are teaching, as best you can. Mark Driscoll is the founding and current preaching pastor of Mars Hill Church in Seattle, Wash.
For the original article, visit theresurgence.com.